Ok, now we're on the new forum, it's time to update how things work! Got a video on YouTube or similar site that you want to share with everyone here? Here's how to add a video to your post. 1. Start a topic/make a post. 2. Go to YouTube, or where ever the video is hosted. 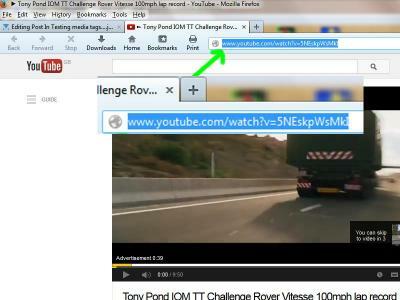 In your browsers web address bar, copy the URL from the web address bar. 3. Now back to your post. Right click and select "Paste". Your link will appear for a few seconds, then the video will appear. Your video will now be displayed automatically in your post. Easy! Why not use our Video Gallery app! It's easy to use, and you can be sure everyone will see your video. The latest videos added to it also appear on the forum index page. 1. To add a video to the video app, just go to the main menu, select "Browse/Videos"
You will see the video app and all the videos other members have posted. 3. Just follow the on screen instructions. There's just 4 easy steps! Also, if you add videos using our video app, all your videos appear on your profile page! So members browsing your profile will see all the videos you've added too. Bonus! We would always recommend using the Video App for all your videos! Got it! I have been trying to figure it out for ages! You should have asked mate ??? UPDATED 7/3/2016 TO WORK WITH OUR NEW FORUM PLATFORM. EVEN EASIER TO ADD VIDEOS THAN IT WAS BEFORE!